Fifth edition Dungeons & Dragons features popular spells like fireball that leave little room for interpretation, but others that require extra help. 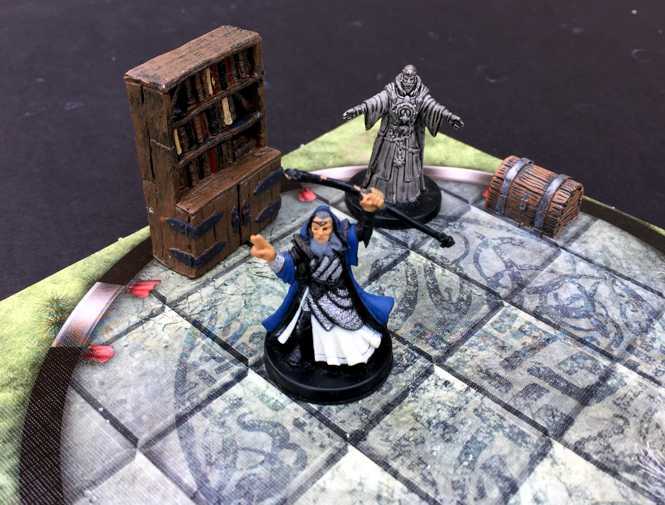 Some spells only become clear after you chase rules in other parts of the book, others make key points easy to overlook, and some just call for tips to run at the table. The Animate Objects spell description never mentions that casters always choose to animate a handful of sling stones or similar tiny objects. I suspect the designers never realized the spell would play this way, and that makes me sad. I want a spell that causes tables, chairs or, best of all, statues to spring to life and attack. In fantasy, that scene appears everywhere. It resonates. Instead, casters choose to use Animate Objects to make make 10 tiny rocks fly up bonk the victim. Visually, the spell looks just like Telekinesis. Except Animate Objects features an attack at the upper limit of the power curve. If I ever expand my list of 4 most annoying spells, Animate Objects ranks number 5 based on failed potential. The ten attack rolls also slow play, and that just adds to the sadness. Animate Objects never matches the popular imagination because the spell works best with 10 tiny objects, which together deal more damage than any other option. I want a spell that forces casters to animate furniture in a room, but D&D delivers a spell that only forces a caster to carry a handful of copper pieces to animate. When animated objects lack legs, they can fly. Because the spell turns objects into creatures, I would rule that a large-sized object could carry a medium-sized rider. This allows, say, a large flying carpet able to carry someone for a minute. Animated brooms lack the size to carry a rider, but halflings can fly medium-sized surfboards. When Banishment sends a creature back to their native plane, the banishment makes a popping noise. If fighting temporarily stops, and then banished creatures return to the battlefield, reroll initiative. This makes the restart of battle more interesting than just letting every player ready an attack for their foe’s return. Plus, the banished creature’s return rates as a game situation that calls for initiative. Everyone stands ready. The best initiative proves quickest to attack. For more on initiative, see What to do When a Player Interrupts a Role-Playing Scene to Start a Battle. The game lacks an official way for spellcasters to identify spells to Counterspell. As a DM, you could require a Wisdom (Perception) check to see the casting, and then a Intelligence (Arcana) check to identify the spell. Nobody dislikes Counterspell enough to impose such hurdles. Instead, use designer Jeremy Crawford’s house rule: If the spell exists on your spell list and you can see the caster, then you can identify the spell. You know the spell’s default level, but not whether the caster has raised the spell to a higher level. Counterspell targets the caster of a spell. Characters cannot target someone they cannot see or someone behind total cover. Whenever possible, enemy spellcasters will work their magic out of sight or beyond the 60-foot range of Counterspell. Force Cage brings enough power to turn many showdowns into one-sided beatdowns. The spell imposes one limitation: The spell’s material components cost 1,500 gp. If the material components for a spell have a price, casting the spell consumes the components. I suspect the designers think the price of a Force Cage limits the spell more it actually does. By the time 13th-level characters can cast the spell, they typically gain 229,242 gp worth of loot. Players rarely cast Globe of Invulnerability, but enemy casters might. Spells of level 5 and lower cannot pass into the Globe of Invulnerability, but Dispel Magic can target and dispel the globe. If a player stands at a threshold of potential fight and wants a d4 bonus to initiative, they can cast Guidance. Initiative counts as a Dexterity ability check, so Guidance helps. Some players always want this boost, so they claim their clerics spend every minute casting Guidance like a nervous tic. Guidance includes a verbal component, so casting creates noise. Because the cleric spends every moment either casting Guidance or concentrating on Guidance, their passive perception suffers the -5 penalty imposed on passive ability checks made with disadvantage. The first time a party member grows tired of the constant incantations and demands silence, I award the player inspiration. This entry was posted in Advice, Rules and tagged initiative, Jeremy Crawford, spells. Bookmark the permalink. Dear David: 1) I never noticed the limitation on the Animate Objects spell, so I tell you what I do: if I don’t like a 5th Edition spell, I simply revert to the 3.5 version! The rules are better known, and easier to handle because they’re better known! Fun read as always, David! At first I thought you were saying that Animate Objects only works that way, but I think you saying that this is the spell option players are choosing. I’m happy to report that in a battle interactive where our goal was to take a bomb into an enemy building, our solution was to animate the large bomb (now it’s a flying bomb creature), make it invisible, cast a few other fun spells on it, then pretend to attack and be routed by the Keep so they sent forces to finish us off. When the main door opened, our Animate aobjects command went off – the invisible bomb flying into the Keep and detonating. Boom! > If the material components for a spell have a price, casting the spell consumes the components. That’s not a general rule. If a spell consumes the component, it says so. I don’t think Force Cage’s requirement is supposed to be limit, other than a situation where you are without your gear. You’re correct. Somehow I thought I knew a specific rule about material components with a price. Thanks! There is a general rule about material components with a gold piece value — you can’t substitute a component pouch or focus for that component. I believe that RAW, an initiative check is not an ability check. The same way that they are adamant that an attack roll is not an ability check. An Attack ROLL, pretty self-explanatory, if you are using an attack (with a few exceptions) to affect an enemy. Uses Weapon or Spell proficiencies and bonuses if applicable. A Saving THROW, to prevent an effect on you. Uses Saving Throw proficiencies and bonuses if applicable. An Ability CHECK (always uses the Check wording) is any roll using your base ability to make something happen. Skill proficiencies may or may not come in to play when making an Ability Check. I’m not sure I understand the issue with counterspell. It doesn’t need a method to identify the spell being cast. In 3e you had to identify the spell first, so you could counter with the same spell. If you didn’t have the same spell, you couldn’t counter it. Counterspell works against any spell, so you don’t need to identify the spell anymore. If you’re concerned about whether to actually use the counterspell, or if it’s not worth using it at that point, I think that’s the risk involved. The problem is that in order to identify a spell that is being cast, you have to use your reaction (ready your action first, then use that to make an Arcana check, assuming we’re using something similar to 3e). Because you HAD to identify the spell first, it created a sequence that is a bit wonky. You waited until they started to cast a spell, which takes a standard action. Then you instantaneously identify the spell (as a free action), and then start to cast the same spell back at them, which also takes a standard action. No matter how you play it, your spell should be cast a fair amount of time after theirs. The new counterspell makes more sense. It takes a reaction, which explicitly interrupts another creature’s action, in other words it is faster than an action. So the timing makes sense, but you’ll have to guess a bit as to whether it’s worth it or not. On the other hand, a wizard can still use their action to make an attack, either with a weapon or a magic item, and still counterspell. Which is better than what could be done in 3e too. I don’t see any problem with counterspell. So you just tell your players the enemy is casting ‘a spell’ and they either choose to use counterspell or not based on this? They never ask ‘what spell’ or expect more? Animate Objects – you “suspect the designers never realized the spell would play this way” – perhaps that’s because it never played that way when they were testing it? It has never played that way at my tables either, but that’s because its usual use, by far, at my tables is by me, the DM, to animate stuff exactly as you describe. But then I never spent the time trying to figure out how to get the most damage out of it. I think there’s a reasonable argument that some of them are too powerful. I think the idea was to balance the damage output regardless of the form taken. Because the spell focuses on the damage possibilities, that’s what people use it for. But it’s really a question of imagination. No matter what you write – in terms of flying ability, carrying ability, attack and damage ability, the caster is going to look for what is simplest to keep with them to be able to use the spell. I can make a large rock fly, (and with your addition, ride it). Because of action economy, multiple attacks, even if smaller, is generally better than a single larger attack. Plus, the tiny items can easily be carried. If there were more restrictions, such as the item needs to have a reasonable mass or form to make an attack (so a cp isn’t sufficient, but a toy doll might be, along with a table or chair). Perhaps it would have been better to not focus on damage at all, and instead highlight that a given object has certain features that can be used – your flying carpet, or perhaps a flying chair. A carpet could roll up and grapple/restrain their target, so could a wardrobe, perhaps. A table couldn’t attack for damage, but could push or knock over a target. An animated suit of armor could attack normally, as could a flying sword. It would require the DM to look to other locations for potential stats. We generally based them off of the stats of animated objects in the MM.